Begin the journey – or write the next chapter to your love story – at Couples, Jamaica’s favorite all-inclusive luxury resorts. From Ocho Rios to Negril, our four oceanfront hotels were built on one idea: true love is the trip of a lifetime. Superior dining, unmatched excursions, unlimited golf, tennis and diving! What do we love? Giving you a little more of everything you love! *Catamaran cruise not available at Couples Sans Souci. Knee Boarding available at Couples Tower Isle and Couples Swept Away. Pedalos available at Couples Sans Souci and Couples Negril. Hydrobike available at Couples Sans Souci and Couples Tower Isle. Lap pool available at Couples Swept Away. Mineral Grotto available at Couples Sans Souci. Popular Sunset bar excursion only available at Negril properties. Dunns River Falls excursion only available at Ocho Rios properties. In room-dining Hours & availability vary by resort. My wife and I have been here 10 times in the past 12 years. That kind of tells you how we feel about Couples Negril. Like they say, "Welcome Home." The minute we get off of the plane and hear the metal drums and singing we know we are in for the vacation of our life. Fine gourmet food, top shelf liquor and it is never ending. We will return again and again!!! Best beach, best staff. Small and so relaxing. The best go to place in the winter. Can't say enough on how much we love this place. Jerk chicken every day! Yum. Waters are pristine and the evening entertainment is exceptional. This place was one of the best resorts I've ever been to. It has amazing food, beautiful resort, clean, friendly staff, several adventures that are all included and the best beach you could ask for! I would recommend this place to everyone and cant wait to return! Very relaxing vacation once again. Our favorite in Caribbean. Great service with a smile. Wonderful fresh food. Very comfortable rooms. Best beach. I highly recommend Couples Resorts they do a great job. Intimate romantic resort. Friendly accommodating staff. Beautiful location. Entertainment whilst dining was a very nice touch. If you are looking for couples only resort then I would recommend this hotel! It was perfect! I will come back for sure. Premium food, premium drinks, premium service! It's a dream of a beach vacation. Perfect white sandy beach, you can walk out for a long while. Awesome games and activities everyday. Stuff that other resorts charge you to participate in is free here. No bracelets, the staff just know who you are! It's not crowded not too busy, really friendly guests. Love it, Just perfect. Get a jump on summer fun with spring Flash Sale savings. 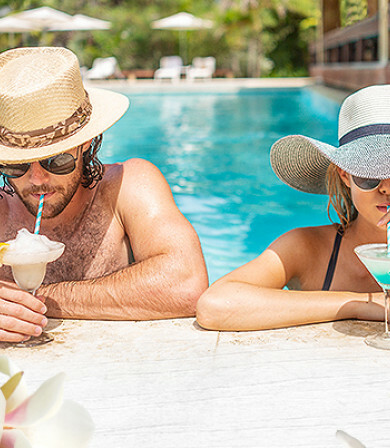 Our four oceanfront all-inclusive luxury resorts make it easy with bonus cash to add a personal touch to your getaway. Plan a couples massage, fill your room with rose petals, or arrange a moonlit dinner for two on the beach. Chat with other guests, share stories and pictures of your Couples wedding or honeymoon, and discover a community of loyal guests and Couples enthusiasts. We hope to welcome you at Couples Resorts soon.